Yet another Wrought Iron Hand Railing Fabrication well done by the crew of wrought iron experts and iron contractors here in San Mateo. San Mateo Wrought iron Experts are all certified wrought iron fabrication proffesionals.We specialize in custom ornamental iron railings, gates, fences, staircases, doors and wrought iron hand rail systems. Wrought iron hand railings are made and fabricated to be vewry safe and durable to last through any season! Better then wood railings due to weather issues. Located in Redwood City in San Mateo County we are here for all your wrought iron hand railing needs. Contact us today for a quick response and a free estimate! 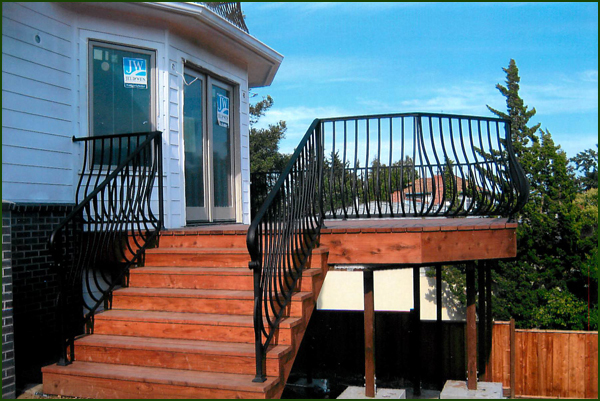 An experienced wrought iron hand railing fabrication speciist will contact you as soon as possible.